Brooks Cascadia 12 are neutral trail running shoes. 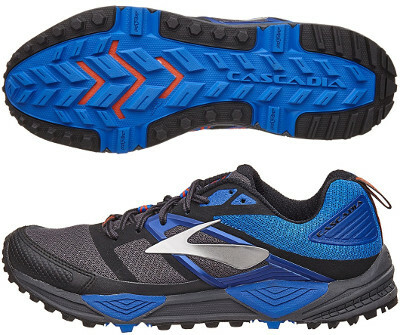 The versatile Brooks Cascadia 12 performs better on technical terrains while keeping abundant plush cushioning and improving protection against external elements. This evolution let the new Caldera position better in long distances segment while Cascadia 12 can focus on medium distances over trickier terrains. Upper is cleaner than in its predecessor Cascadia 11 with fewer fused overlays over breathable mesh. Reinforced toe cap provides extra safeguard against external elements and bulkier heel collar protects better achilles area. Midsole in Cascadia 12 keeps great cushioning provided by reliable BioMoGo DNA foam already present in other running shoes from the american brand like popular Ravenna 8. There is a rock shield which not only protects forefoot from sharp objects but also allows enhanced performance with springer toe-off. Outsole keeps what is was working fine with 4 point pivot posting system for extra stability on tricky terrain without feeling intrusive and outsole has been redesigned with multi-directional lugs for improved traction on technical grounds.